Sparky3000 (Wallpaper Portfolio) Bring it on! I know this is sort of basic but oh well. I thought this kind of fits the image I have. The image I got was slightly pixelated and the color was off. So I raise the solution, edit the levels. Then I duplicated the file, guassain blur it a bit, then use hardlight to overlay it to brighten it bit more. Then add the black part of the wallpaper, edit the levels a bit more. for the final touches I added a lense flare to the side of the gun. 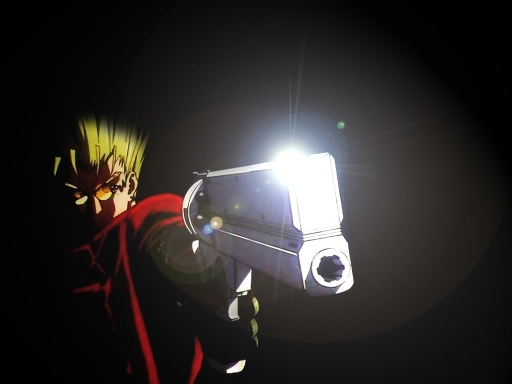 Vash is a wanted legendary gunman known throught the entire planet as the "humaniod typhoon," "first human natural disaster" due to he brings destruction to everywhere he gose. He also has a 60 billion double dollar bounty on his head, which everyone wants. He has a great skill in gunmanship, with precise aim, amazing speed, and the ability to shoot large distances. But Vash is a caring easy going goofball paficist, who never kills his opponents. He is also a womanizer and gose gaga for pretty women and have a big love for doughnuts. He runs around with the catch phrase "love & peace!!" The image is a screencap from the opening taken by animegalleries.net. I also credit Silvermoon for the awsome AMV, which lead me to the idea for this wallpaper.